KAMAT GmbH & Co. KG . Salinger Feld 10 . 58454 Witten . Germany Phone: +49 2302 8903-0 . Fax: +49 2302 801917 . Mail: info@KAMAT.de . www.KAMAT.de Smooth operation at bigger flows Product data Parameters 1185 l/min (max) at 350 bar Fluid Viscosity < 2000 mPas 763 l/min (typ) at 360 bar Input power 800 kW (max) up to 641 l/min at 430 bar (max) without boosterpressure Operating Pressure 3500 bar (max) HIGH PRESSURE PLUNGER PUMPS AND SYSTEMS LESS IS MORE Where others need more pumps, we simply use bigger ones. 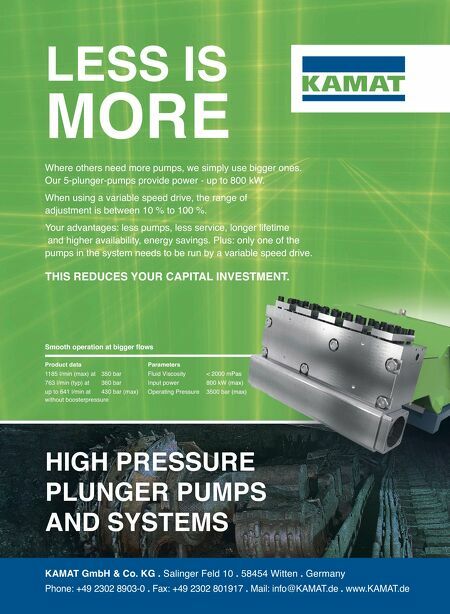 Our 5-plunger-pumps provide power - up to 800 kW. When using a variable speed drive, the range of adjustment is between 10 % to 100 %. Your advantages: less pumps, less service, longer lifetime and higher availability, energy savings. Plus: only one of the pumps in the system needs to be run by a variable speed drive. THIS REDUCES YOUR CAPITAL INVESTMENT. < 2000 mPas 800 kW (max) 3500 bar (max) HIGH PRESSURE PLUNGER PUMPS Your advantages: less pumps, less service, longer lifetime and higher availability, energy savings. Plus: only one of the pumps in the system needs to be run by a variable speed drive. THIS REDUCES YOUR CAPITAL INVESTMENT.